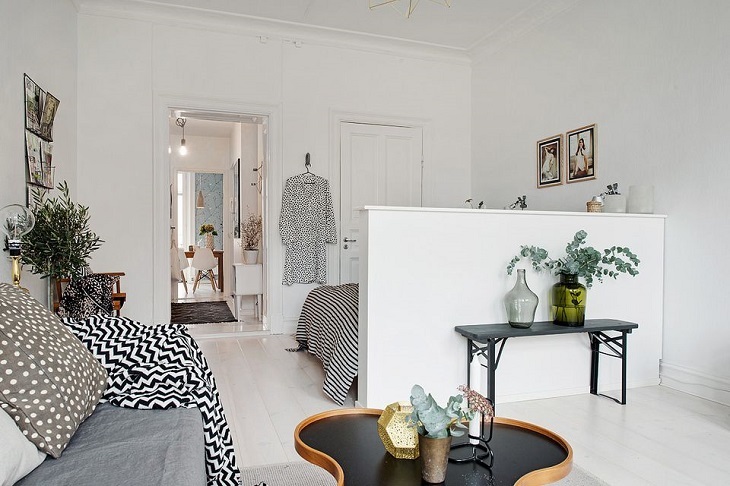 In this article we have selected ten ways to divide the space in your studio apartment. 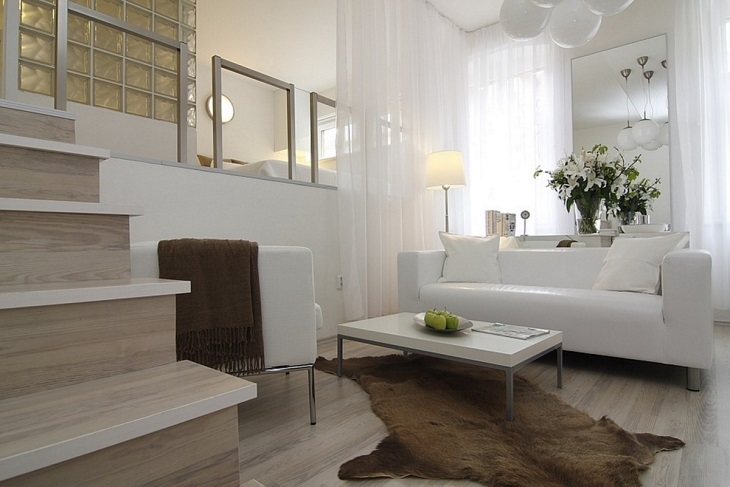 When you live in a single room it is a great idea to find ways to divide the space in your studio apartment. 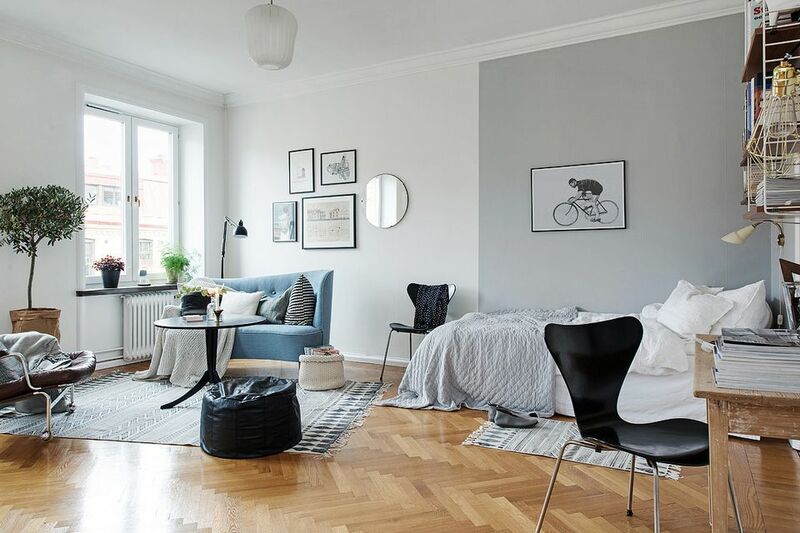 By dividing your studio apartment into multiple rooms, you can transform a small space into a functional and comfortable home. You can carve out certain areas that function differently. The point is to find flexible solutions that don’t take up too much valuable space. 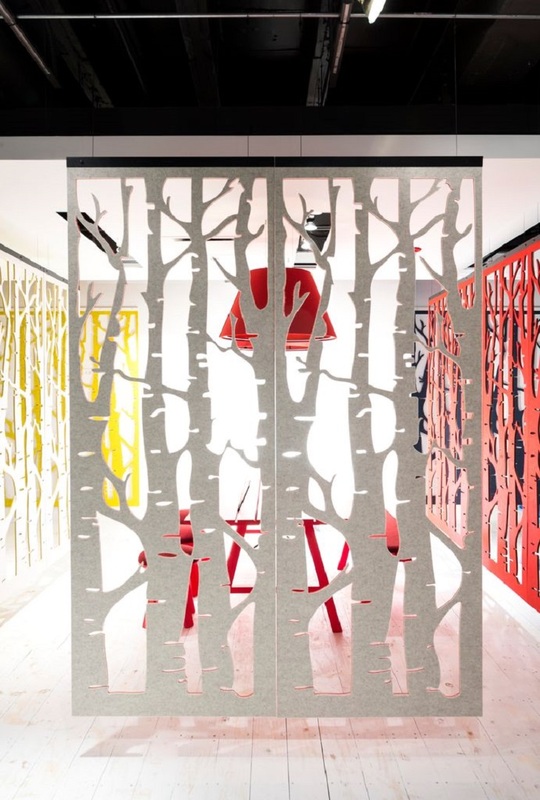 There are several ways to establish visual barriers between spaces such as room dividers. A carefully selected room divider has many advantages. For example this one on the picture! This half-wall divides the bedroom from the dining area and it also leaves the space open. Plus there is plenty of storage provided by this half-wall. Here is another half-wall idea. This is a great option if you would like to leave your space bright and open. With the half-wall you can divide your square footage into zones for specific uses, such as living room and bedroom here. If you are lucky enough to have a high ceiling apartment, it can be easily transformed into a split level studio. A great advantage to this solution is that the space under the stairs can be transformed into a spacious storage. There are so many room divider ideas and designs out there! It is not easy to find the right style but with a beautiful room divider such as this one on the photo you can not go wrong. One side of it functions as a headboard and the other one can be used as a work desk. An easy and inexpensive way to carve out a bedroom in your studio apartment is to define the space with wall paint. The contrasting wall colors shown above divide the studio apartment into two distinct rooms. This is a creative way of utilizing sliding doors in a small apartment. 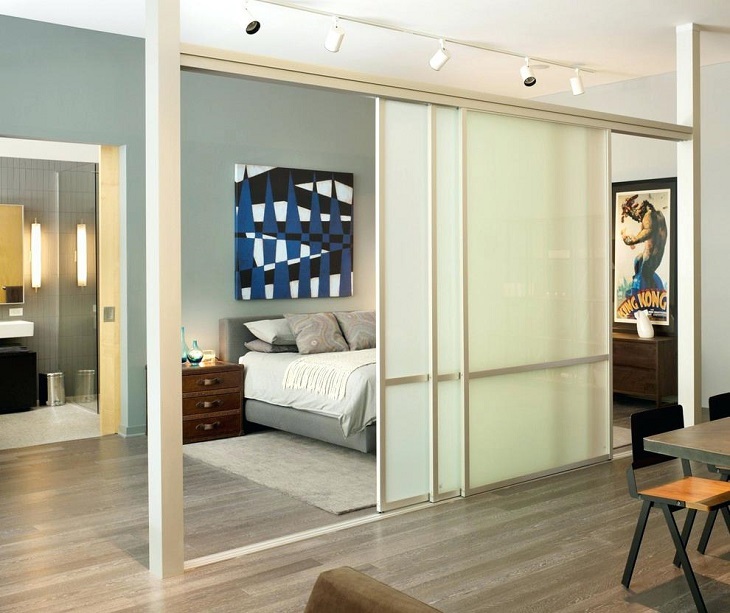 The simple sliding glass door creates a modern and chic atmosphere in this apartment. Besides, the door separates the bedroom from the living area leaving it spacious and uncluttered. Panel curtains are excellent room dividers! 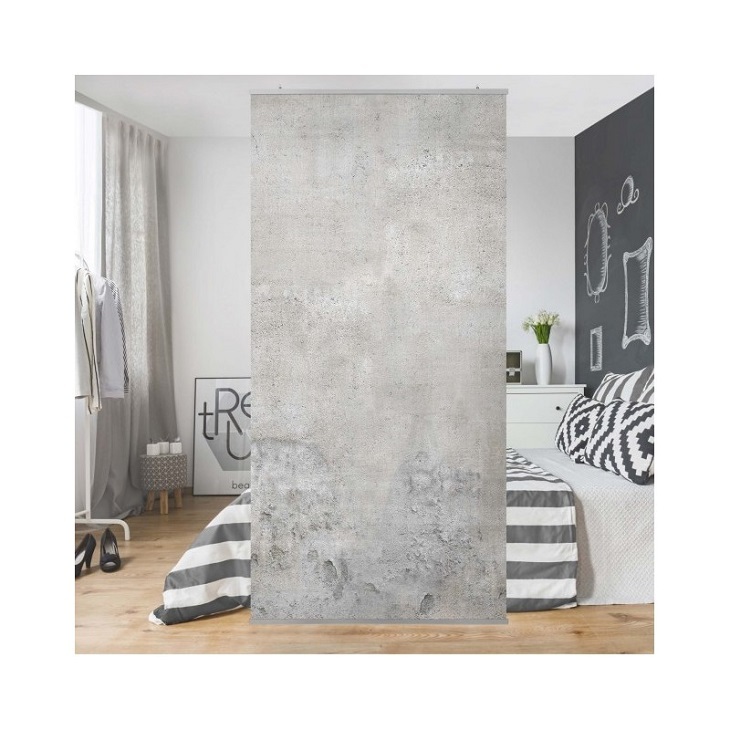 This Shabby concrete look panel curtain, room divider offers a brilliant way to restructure your home creating more room. It is available without hanger or with transparent hanger or with magnetic aluminium hanger. 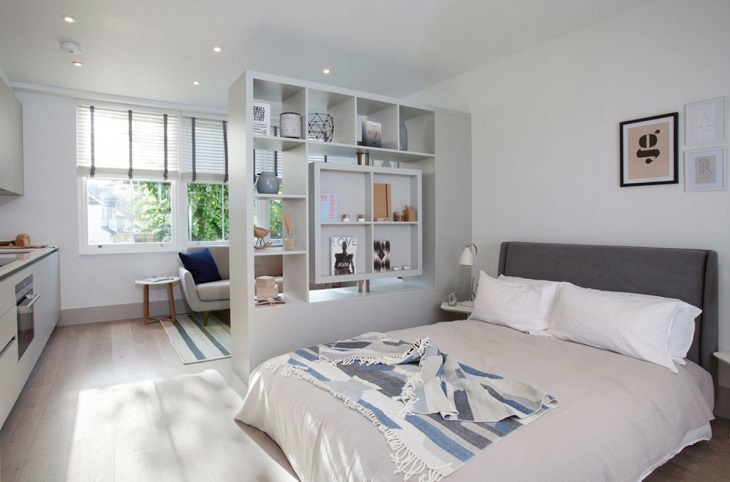 Does you apartment feel more like a bedroom than a multi-functional space? With the help of a single piece of furniture you can create the separation you need to have a home office or living room. The IKEA Expedit shelving unit gives you more storage as well. With this unique floor-to-ceiling wooden panel you can create charming atmosphere in your home. The rustic wall and chandelier is in a perfect harmony with the modern table and chairs. Check-out the super cozy sleeping nook behind the wall! This space divider made of felt is not only unique, but it also can change the lighting, and therefore the mood of two different sections of your apartment. It won’t give you storage however it leaves the room spacious and breezy. Inspired By the home decor ideas. Thanks for sharing such an amazing idea with us.